The Western media has left Aleppo, where the situation is dramatically improving now that the terrorists have been defeated. Meanwhile, Mosul evacuees are getting all of the attention, says journalist Rick Sterling and Anglican Priest Andrew Ashdown. 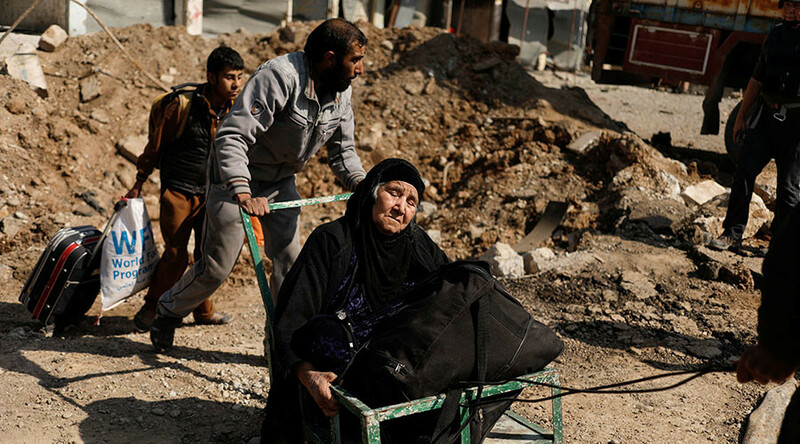 Thousands of civilians are fleeing the city of Mosul in Iraq on a daily basis, according to the UN. The intensified fighting between US-backed Iraqi forces and ISIS-led terrorists is leading to an increasing number of civilian casualties. However, Western mass media coverage is much more one-sided when it comes to Mosul, compared to how it has been portraying the situation in Aleppo. RT: How different is the situation in Aleppo from what is happening in Mosul? RT: Would it be fair to say that media coverage of Aleppo focused on civilian suffering, while reports about Mosul have focused on military success against ISIS? If so, why's that? RS: It is because of the inherent bias of the media. The Western media, unfortunately, has entirely left Aleppo, where the situation is dramatically improving now the terrorists have been defeated. 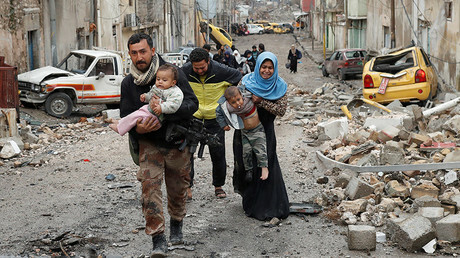 Right now civilians are returning to the neighborhoods that were occupied by the terrorists. They are starting the cleanup process. The Syrian Arab Red Crescent is installing electric generators and water tanks. There are a lot of positive developments going on, but when the terrorists left, the White Helmets left, and unfortunately the Western media left also. RT: We spoke to Mosul residents, who told us they fear both the terrorists and the coalition. In your view, is the so-called 'collateral damage' in Mosul being given enough attention? Why is the media turning a blind eye? RS: They definitely focused on that with Aleppo. I think there is some coverage of that in Mosul. As to why, it is because the US air coalition is supporting the Iraqi government in recapturing Mosul, whereas the Western media basically in support of the Western governments has been more sympathetic to the armed opposition in Syria. When Aleppo was finally liberated, not one Western organization went in to talk to the thousands of people who fled to government-controlled areas to hear their stories, says Andrew Ashdown, Anglican Priest, who just returned from the region. RT: You've been to Aleppo, and you saw what was going on the ground. How different was it to what's happening in Mosul right now? Andrew Ashdown: It is truly remarkable the way in which these two situations are being reported because there are similarities. I was watching, for example, the latest BBC report [yesterday] of the terrible situation in Mosul. All the emphasis is on the Iraqi government forces fighting extremist terrorists ISIS in the city, who are besieging the city and holding the civilians hostage, and showing the thousands of people fleeing the city; then going to talk to them in the refugee camps – they’ve been in the hundreds today. In Aleppo, the situation there has similarities as well, except that in Aleppo the government was fighting extremist forces that are absolutely acknowledged, linked to ISIS, certainly with similar ideologies that the main groups responsible in East Aleppo. There is no guarantee that American bombs are any safer than Syrian or Russian bombs. 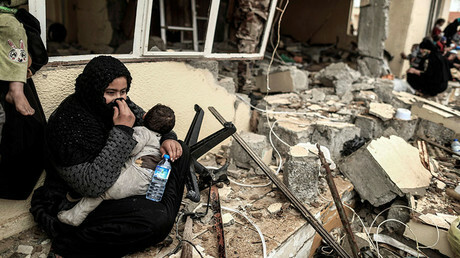 We now know that civilians were suffering, being held by terrorists and suffering enormously under their occupation, as well. What is very interesting is that when Aleppo was finally liberated, not one Western organization went in to talk to the thousands of people, who either fled to government-controlled areas or are now being looked after in the government-controlled areas, to hear their stories. It didn’t happen at that time, it is not happening now. Nobody is in Aleppo talking about the situation there. RT: Why do you think the Western mainstream media, changed the way they approaching the story, depending on whether it’s Aleppo or Mosul? AA: The agendas are completely different. In Syria, there is a clear and declared state where some Western nations want regime change. There is a real irony here that the US and alliances that are fighting against ISIS in Mosul – of course their allies, Saudi and Qatar, are also funding ISIS that the US is fighting. It is not being very much reported in the West here that the UN in January said that almost half of the casualties in Mosul were civilians. In Aleppo, it was stated that the Syrian government and the Russians were targeting civilians in the thousands. Meanwhile, the US allies in Mosul, thousands of civilians are being killed. There is no guarantee that American bombs are any safer than Syrian or Russian bombs. And you’re dealing with an urban warfare situation, where populations are being held by extremist, brutal Islamist groups in both contexts. But it is being reported completely differently according to each situation.